The NHL is a young man's league, but that doesn't mean the kids have a monopoly on big-time accomplishments. Landmark achievements and individual awards usually belong to younger players, but players who've reached their 35th birthday have made their share of history. No athlete in the history of professional sports is comparable to Howe. "Mr. Hockey" was a great player when he was young and was still great when he old enough to be the father of some of his teammates. But his best NHL season, in terms of points, was in 1968-69. One day before his 41st birthday, Howe scored a goal in Detroit's 9-5 loss to Chicago (the Red Wings' 76th of 78 games) to reach the 100-point mark for the first (and only) time in his NHL career. He's still the oldest player to reach triple digits in points. Howe finished that season with 103 points (44 goals, 59 assists). After two more seasons with the Wings, he went on to play six more in the World Hockey Association before returning to the NHL with Hartford in 1979-80 -- scoring 15 goals as a 51-year-old. Bucyk had enjoyed a long and productive career before becoming a key part of the "Big Bad Bruins" in the early 1970s. He had just turned 35 when he became only the fifth player in League history to reach the 100-point mark by scoring a goal in Boston's 6-3 win over Vancouver. Ratelle is the only 35-and-over player to reach triple digits in points while splitting his season between two teams. The New York Rangers dealt him to Boston in November 1975 after he had 15 points in 13 games; he added 90 more in 67 games after the trade to complete the second 100-point season of his career. Ratelle went on to average better than a point a game for five more seasons in Boston on the way to the Hall of Fame. Gretzky turned 35 about two months before he hit triple figures for the 15th and final time in his career in 1995-96. He had recently been traded from Los Angeles to St. Louis when he earned an assist during the Blues' 4-4 tie with New Jersey for point No. 100; he finished with 102, including 79 assists. 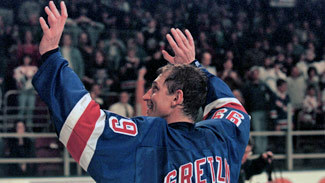 Gretzky signed with the Rangers that summer and barely missed another 100-point season in 1996-97 (97 points). He also had 90 points in 1997-98. Perhaps the most surprising 100-point season by anyone 35 and over belongs to Sakic, whose 36th goal and 100th point in 2006-07 came in Colorado's season finale against Calgary on April 8, 2007. It was the sixth 100-point season of the 37-year-old center's career, but the first since he had 118 in 2000-01. It was also something of a last hurrah -- injuries limited Sakic to just 59 games and 15 goals in the next two seasons before he retired; he will be inducted into the Hockey Hall of Fame this fall. Tampa Bay's Martin St. Louis just missed joining the club in 2010-11 -- at age 35, St. Louis piled up 99 points, finishing second in the scoring race behind Vancouver's Daniel Sedin. It’s rare enough to find a 50-goal scorer who's reached 30 (the last one was Jarome Iginla in 2007-08), let alone 35. In fact, it's been done only once. Three days after reaching the 100-point mark, Bucyk became only the fifth player in NHL history to score 50 goals in a season when he beat Roy Edwards during the Bruins' 11-4 victory against Detroit on March 16, 1971. It was the only 50-goal season of Bucyk's Hall of Fame career. Since then, the oldest 50-goal scorer has been Jaromir Jagr, who scored 54 times in 2005-06, his age-34 season. It was the third 50-goal season of Jagr's career. After Bucyk, the oldest first-time 50-goal scorer was Joe Mullen, who turned 32 during the 1988-89 season when he scored 51 goals for Calgary. Among players who were at least 30 for all of last season, Montreal's Erik Cole was tops with 35 goals, a career-best at age 33. Among players 35 and over, New Jersey's Patrik Elias and Anaheim's Teemu Selanne shared the lead with 26. Shore was the NHL's best defenseman of the pre-World War II era, leading the Boston Bruins to Stanley Cups in 1929 and 1939. He also won the Hart Trophy as the League's MVP four times. The last came in 1937-38, when the 35-year-old had three goals and 17 points. Since World War II, the oldest winner was Gordie Howe, who was 34 when he won the sixth and final MVP award of his career with Detroit in 1962-63. Since expansion, the oldest winner was Buffalo goaltender Dominik Hasek, who turned 33 midway through the 1997-98 season, when he repeated as the Hart Trophy winner. Who has been the NHL's best position player in the 21st century? You can make a strong case for Lidstrom, who won the Norris Trophy in 2001, 2002 and 2003, missed in 2004, then won three more in a row after turning 35 before finishing third in 2009. He wasn't among the three finalists in 2010 but won it again in 2010-11, giving him seven in a career that will put the recently retired Detroit captain in the Hall of Fame as soon as he's eligible. Lidstrom was the prototypical 21st-century defenseman -- a smooth puck-mover who was solid in his own zone, made a good first pass, could carry the puck, run the power play and devour minutes. Though he wasn't a big hitter, he was so positionally solid that his man rarely got free and opponents rarely were able to hit him cleanly. Lidstrom was still among the NHL's best defenders last season (11 goals, 34 points, plus-21), but he opted to call it a career and will serve as a scout for the Wings. Hall of Fame member Ray Bourque was also an elite player after 35 -- he was a First-Team All-Star in his final season at age 41 -- but won the Norris for the fifth and final time when he was 33. Chris Chelios, who also had several good seasons after age 35, was also 33 when he won the Norris for the third and final time. By today's standards, Harvey's offensive numbers don't look like much -- but they don't even begin to tell the tale of his greatness. Harvey could control the tempo of a game like few players before or since. Harvey's brilliance was a key to Montreal's run of five straight Stanley Cups from 1956-60. But after the Canadiens had their streak ended by Chicago in 1961, they were content to let Harvey move along, even though he was coming off his sixth Norris Trophy-winning season in seven years. He went to the New York Rangers, who hadn't made the playoffs since 1958 -- and showed that he was far from washed up. With Harvey solidifying the blue line, the Rangers outfought Detroit and made the playoffs -- their only trip to the postseason between 1959 and 1967. Harvey's numbers (6 goals, 30 points) weren't spectacular, but his performance was enough to earn him his seventh Norris Trophy as the NHL's top defenseman. Harvey played another full season with the Rangers, then spent several seasons in the minors before playing 70 games with the St. Louis Blues in 1968-69 -- and helping the second-year franchise to the Stanley Cup Final. Thomas is one of the latest bloomers in sports history. He played four years of college hockey at Vermont (where he was a teammate of Martin St. Louis), then spent eight seasons in the minors and Europe, earning only a four-game trial with the Bruins in 2002-03. After starring with the Bruins' AHL team in Providence and Jokerit of the Finnish League in the next two seasons, he finally got a chance to play with the B's in 2005-06 at age 31 -- and not until injuries wiped out Boston's top two goalies. Thomas won the Vezina Trophy as the NHL's top goaltender in 2008-09 at age 34, but lost the starting job to rookie Tuukka Rask the following season while dealing with a hip injury. He rebounded in '10-11 to lead the NHL in goals-against average (2.00) and save percentage (.938), then led the Bruins to their first Stanley Cup since 1972. Thomas, who turned 37 just as the postseason began, also became the oldest player to win the Conn Smythe Trophy as playoff MVP with 16 victories, a 1.98 GAA, a .940 save percentage and four shutouts. He was solid in 2011-12, going 35-19-1 with a 2.36 GAA and .920 save percentage, but has said he plans to sit out the '12-13 season. Hasek's NHL career also got off to a late start -- he didn't come to North America from Czechoslovakia until he was in his mid-20s and didn't become a full-time starter until he was nearly 30. But Hasek quickly made up for lost time; he became the NHL's dominant goaltender in the late 1990s, and in 1997 became the first goalie in more than 40 years to take home the Hart Trophy as League MVP -- then won again the following season. Hasek was still at the top of his game for Buffalo in 2000-01, during which he turned 36 -- winning 37 games with a 2.11 GAA and a League-high 11 shutouts. That was enough to win the Vezina for the sixth time in eight years. He was traded to Detroit that summer and led the Red Wings to the Stanley Cup in 2002. At age 43, he also combined with Chris Osgood to win the Jennings Trophy and was part of a second Cup-winner with the Wings in 2008. After taking a year off, he played two more two seasons in Europe. Brodeur will probably own all the major goaltending records when he finally puts away his pads -- he already has the marks for wins (661) and shutouts (119). Brodeur was as good as ever in 2007-08, when he edged San Jose's Evgeni Nabokov to win the Vezina Trophy for the second year in a row and fourth time in five years (he was second to Miikka Kiprusoff in 2005-06). He went 44-27-6 with a 2.17 goals-against average and .920 save percentage in a season that concluded just before he turned 36. It's not unthinkable that Brodeur could win another Vezina -- after all, he led all goaltenders in wins (45) and shutouts (9) in 2009-10 and was a finalist for the award. After an off-season in 2010-11, he rebounded by leading the Devils to the Stanley Cup Finals this past spring. Esposito didn't play his first NHL game until he was 25 and had to go from Montreal to Chicago to become a starter. But 10 years after posting 15 shutouts and winning First-Team honors as a rookie, Esposito was again the best goaltender in the new 21-team NHL, going 31-22-16 with a 2.97 GAA and six shutouts for Chicago. The Blackhawks let Hall, then age 36, go to St. Louis in the 1967 expansion draft, thinking he was too old to carry the load in an era that still saw many teams give the vast majority of work to one goaltender. But the combination of Hall and another old-timer, Jacques Plante, worked perfectly for the Blues, who made it to three consecutive Stanley Cup Finals. Hall became the first member of an expansion team to be named a First-Team All-Star in 1968-69, when he went 19-12-8 with a 2.17 GAA and eight shutouts for the Blues. The Montreal native was coming off a poor season in 1966-67 (3.18 GAA in only 18 games), but was almost flawless in '67-68. The Gumper went 19-9-8 and posted a 1.98 GAA and six shutouts in the regular season, then went 11-0 in the playoffs with a 1.88 GAA as the Canadiens won the Stanley Cup for the third time in four years.